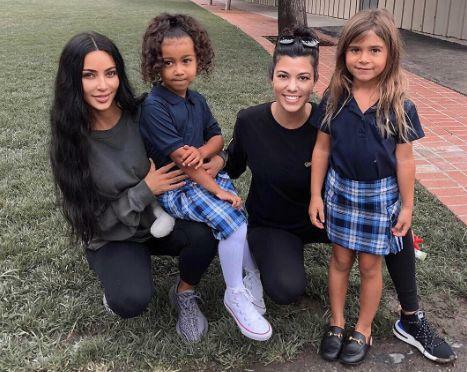 Kim took to her Instagram to post the sweet photo of the four ladies posing just outside of the girls’ school and in their matching uniforms. However, followers couldn’t help but notice that while North is rocking a pair of casual Converse, her cousin Penelope is wearing nearly $700 Gucci mules. The little girl was also called out for her hair, since it seemed to be back to its longer length after being cut short just two months ago. “Is P wearing extensions? How did her hair grow so fast...” one follower questioned. However, others quickly deciphered that the picture was likely snapped when the girls first started school at the end of the summer, because of the long locks and both of their golden tans. Most Kardashian fans had positive things to say about the photo since both Kim and Kourtney were looking very natural.